Donald Harington was much on my mind last Saturday, November 7, as I attended a wedding in the vicinity of Murray, Arkansas, a place well off the paved roads, southwest of Jasper, the county seat of Newton County. 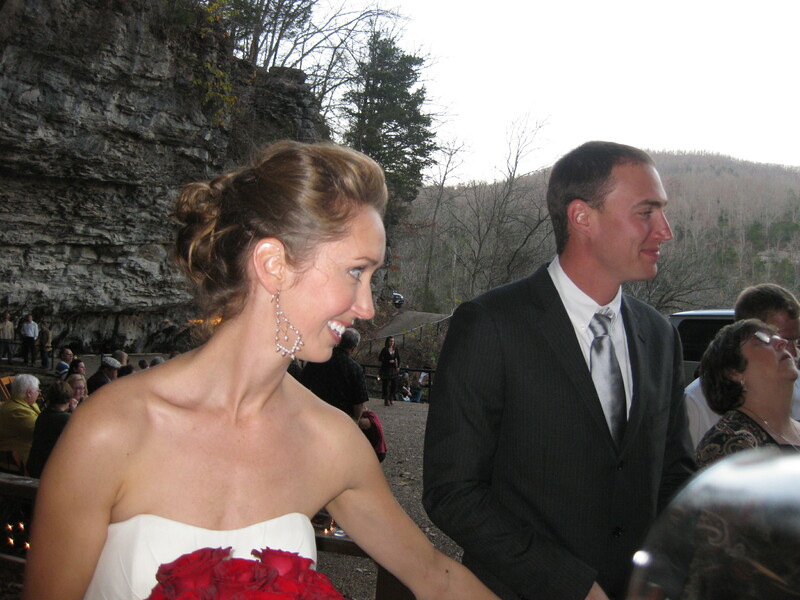 On this spectacular day–an outdoor wedding in November!–I watched Julie Brown and Dan Osterkamp start their married life in the midst of family and friends, against a stunning limestone bluff, to the accompaniment of a gurgling stream. On this lovely day, Donald Harington died of pneumonia, ending of a long battle with cancer, in Fayetteville, where he had lived and worked for many years as a professor of art history at the University of Arkansas. The New York Times obituary of Donald Harington is as thoughtful as any I’ve read. If you know of others, please add them below. Harington is well-known in the Ozarks for his novels that are set in Newton County, Arkansas, around the community he called Staymore. The quality of Harington’s fiction seems erratic to me, except that it is usually engaging and often hilarious. He created characters who settled Staymore, or were born there, leaving and returning, over the last few hundred years. He gives them ideas appropriate for their times, houses them in a variety of structures, and links them to one another in many ways, genetic, financial, sexual, and political. One branch of my ancestry, led by Ezekiel and Talitha Shaddox, homesteaded in Newton County in the 1850s, just below Pruitt, where Mill Creek spills into the Buffalo River. Harington’s ability to evoke what Newton County was like in times past adds color and detail to my own mental pictures of the lives and surroundings of my forebears. The fiction of the Ozarks is rich but not deep. Harold Bell Wright’s novels, such as The Shepherd of the Hills (1907), are the prototypes of romance novels, immensely popular but without great characterization. Thames Williamson’s short novel The Woods Colt (1933) tells a gripping story of a family involved with an illegal distillery and rough characters in northern Arkansas and is enhanced by Williamson’s great ear for dialect and dialog. The finely-crafted novels of Douglas Jones describe the Civil War in the Ozarks. Wilson Rawls’s Where the Red Fern Grows (1961), set in the Oklahoma Ozarks near Tahlequah, is a powerful story, up there with and in the genre of Shane and Old Yeller: I’ve been told that the 1973 movie version was shown at a local coonhunters’ association meeting, after which all the coonhunters walked out to their trucks without speaking or exchanging glances, keeping their tears to themselves. More recently, Daniel Woodrell’s novels depict rural poverty and social disintegration in the modern Ozarks. I have not read Gary Blackwood’s well-regarded novels, such as Moonshine (1999). Dee Brown, whose historical fiction and non-fiction occasionally touched the Ozarks, consistently wrote at a high level, including in Way to Bright Star (1998), which describes a couple of young men who were hired to take a couple of camels through northwestern Arkansas and southern Missouri during the Civil War. Brown’s 1993 memoir When the Century Was Young: A Writer’s Notebook includes the comedic tale of Brown and a friend being thrown in the Newton County jail for a crime they didn’t commit. Brown is most famous for Bury My Heart at Wounded Knee (1970), which is a collection of essays about the U. S. government’s execution of Native Americans, and his best-selling novel Creek Mary’s Blood (1980), which is the fictionalized story of several Cherokee families (including several of my maternal ancestors and collateral kin) from the sixteenth through the 20th centuries. Some of the scenes in Creek Mary’s Blood take place in the Ozarks. Harington’s contribution to Ozarks literature is substantial. If you haven’t read Donald Harington’s fiction, you might want to start with The Architecture of the Arkansas Ozarks (1987), and work through the twelve other novels. I’m also a fan of Let Us Build a City, a non-fictional exploration of eleven places in the Ozarks with “city” in their names, with special attention to the aspirations of the promoters of these towns that never grew. This essay by Steve Reed describes Harington’s distinct skills as a storyteller and gives an overview of his fiction. During the summer of 1994 I was on a camping trip in Northern Arkansas. As I was driving my jeep across the river at St. Joe, AR, I misjudged the depth and my jeep trailer started dragging me downstream. I got the trailer unhooked and walked a mile to a farmhouse where I was able to get some help in pulling my jeep out of the river. I bought some used oil from him and got back on the road. The book I was reading during this trip was Harington’s Architecture of the Arkansas Ozarks. I threw the book onto of my jeep roof along with my camera when I flooded. Your mention of Harington brought back some good memories and laughs and a desire to re-read his book. I found it on my bookshelf this evening. I will re-read the tale of the Ingledews. I am sorry to hear of Harington’s death but his memory will live in his books. Thanks for reminding me. The Kansas City Star paid tribute to Donald Harington as a talented and respected author whose books will immortalize him and small town life and characters set in the Ozarks. I haven’t read any of his books but now I will! We have to hope that “reading” and “writing” will not go out of style because of the Internet and concepts like “twitter” that presumes that there is so much information that we can only absorb it in small bites. Is twitter for twits? There were twits long before there was Twitter. In fact, I’ve been a twit on occasion, though I have never tweeted. I do not hear real good and took a moment to digest that statement particularly after reading all of Donald Harington’s books in which the main character does not hear well (Donald was deaf) and often hears something other than what was actually said. I thought it over and decided that I had indeed heard “Donald Harington”. Barry said yes. I said “Are you the guy that wrote ‘The Architecture of the Arkansas Ozarks’?” He said yes. I said “Where is ‘leapin’ rock’?” And Donald Harington pointed downstream a little ways to an outcrop of limestone. Thanks, John, for a great story confirming that Murray, Arkansas, is the fictional Staymore, insofar as Murray is the site of Leapin’ Rock. Harington might have borrowed aspects of Drake’s Creek and Parthenon and Murray and rolled them all into Staymore. Whatever Harington did in his creative process, the real Murray and the fictional Staymore are both as magical as Brigadoon and seemed especially so on your daughter Julie’s wedding day. That other fictional Newton County community, Dogpatch, just doesn’t measure up. Professor Harington was my teacher at the University of Arkansas and I was so excited to find your post on him! He was my biggest influence to pursue art history, and I love his books. I remember that once in class he said his favorites of his own composition were Lightning Bug and then his most recent one at that time, Farther Along, but his favorite book was Don Quixote. I know he will be remember by many people for many years to to come. Thanks for writing. It’s great to have comments from people who knew Mr. Harington. Thank you for linking to my essay on Donald Harington, which originally appeared in the Arkansas Democrat-Gazette in 1996. I am sorely missing my friend of 15 years. My knowing him began with our both independently discovering one of the great hidden treasures of television, the sadly truncated series “My So-Called Life.” We joined the same fan mailing list — and HE, having liked a brief commentary of mine, sent ME a fan letter. I hadn’t heard of him, so it took a while to dawn on me just what kind of fine, inventive, productive spirit had bothered to take notice of something I’d written … and what an honor it was! When I met his charming wife, Kim, on the phone, she induced me to take a look at his fiction, and I devoured all his books then to date in four months. Stay More will go on. Don’s gliding into future tense at the end of each of his novels presaged how his reputation will live on, among a small but passionate readership. One that, thanks to the generous spirits at Toby Press (which has reissued his whole backlist), will only grow. This denizen formerly of the Midwest and now of Los Angeles will always have a large corner of his heart in Newton County, Arkansas, and gladly so.